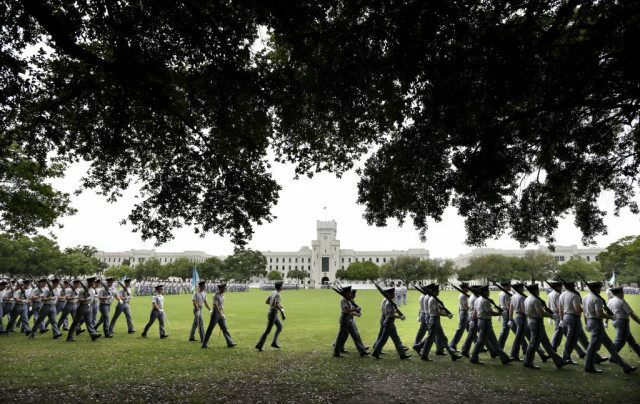 CHARLESTON, S.C. (AP) — An incoming freshman female student at The Citadel has asked the military college to let her wear a traditional Muslim headscarf when she begins classes in the fall, the first time such a request has been made at the school known for its buttoned-up uniforms and close-cropped haircuts. Citadel spokeswoman Kim Keelor said Friday that although a number of Muslims have attended the public college, she hasn’t heard of any of them ever asking to wear a headscarf. The school said it was reviewing the student’s request. Keelor wouldn’t identify the student or say where she was from, citing privacy concerns. The request was first reported by The Washington Post, which identified students, alumni and others reacting on social media. Cadet Nick Pinelli, who is expecting to graduate in May, told The Associated Press on Friday that he doesn’t think she should be able to wear the headscarf. Pinelli said that there has been talk around campus about the woman’s application for several weeks. “The system is what’s important. It’s not about her or her religion. I have to put my cross under my shirt but I also have to put my dog tags under my shirt. It’s not the cross they care about,” he said. Citadel cadets are required to wear uniforms nearly all of the time. The school has a 35-page booklet of rules and regulations addressing military courtesies and uniforms. The school, with its strict discipline and rich tradition, was embroiled in controversy during the 1990s as it fought — and later relented — the admittance of its first woman cadet, Shannon Faulkner. Earlier this year, 14 cadets were dismissed, suspended or served on-campus punishments after several of them appeared in photos with pillowcases on their heads similar to Ku Klux Klan garb. The Citadel said a decision on whether to allow the headscarf should be made in several weeks. Recently, a U.S. Army captain and three Army enlistees who are Sikh won permission from the military to wear turbans and beards after filing lawsuits. Their religion requires men to grow beards as an article of faith. And last year, a federal judge in Washington ruled that a Sikh college student attending Hofstra University on Long Island, New York, could enroll in the U.S. Army’s Reserve Officer Training Corps without shaving his beard, cutting his hair, or removing his turban. The judge ruled that Iknoor Singh’s adherence to his religious beliefs would not diminish his ability to serve in the military.